Ethan Baehrend, 18, founder and CEO of Creative 3D Technologies, announces the launch of his company and its first product, the CreativeBot Duo – a high-quality, large-format, independent dual extrusion 3D printer that was created because nothing like it exists on the market today. With the CreativeBot Duo, Baehrend and Creative 3D Technologies aim to significantly improve accessibility to this innovative technology and its vast array of features. Regularly priced at $8,800, the CreativeBot Duo is faster, larger, easier to use, and more capable than any other similar 3D printer near its price-point — at a fraction of the cost. A Founders Edition is being made available for a limited time for $8,000. Baehrend, a senior in high school who bought his first 3D printer at the age of 13 and started a business refurbishing and upgrading 3D printers later that same year, designed the CreativeBot Duo to be a significant improvement over the underwhelming, clunky and expensive large-format 3D printers currently available in the market. Now, a year after being the youngest exhibitor at the 2018 Consumer Electronics Show (CES) displaying one of his prototypes, the CreativeBot Duo is available for purchase. We’re bringing a fresh perspective on a market structure that’s more or less not changed for long time, …, We’re willing to take the risks and put forth the work to push boundaries and provide the very best that this technology has to offer, at a price that customers want and can afford. 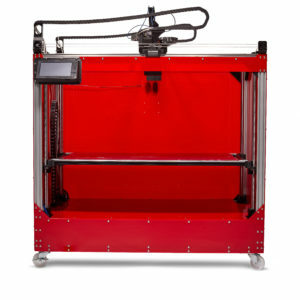 With its large build volume, high-quality components and built-in responsive, smart interfaces, the CreativeBot Duo is ideal for small businesses, researchers, and prototypers — while still being big enough, capable enough and fast enough to rival many other large-format printers in the industrial market.